Telluride is a destination for all seasons with an impressive ski resort and summer access to some of the most inspiring mountain terrain in the world. 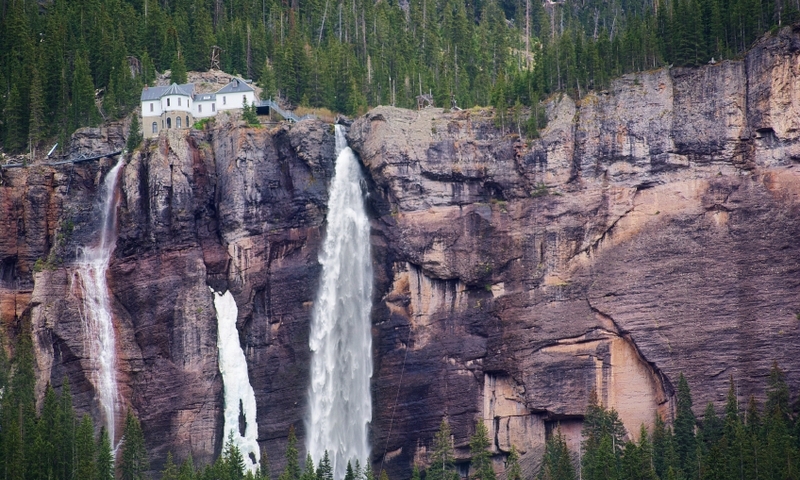 This is Colorado’s highest free-falling waterfall at 365 feet, and standing underneath the two-pronged downfall is exhilarating. A truly breathtaking Telluride attraction. The San Miguel exits the mountains above Telluride and flows through town on its way down valley to the Dolores. Go swimming in Town Park or give your best shot at the trout anywhere along the river. These stunning high-alpine lakes are only a half-hour drive from Telluride and are worth a visit in summer or winter. This 236-mile loop through the San Juans passes through Telluride, Durango and Silverton while traversing high-alpine passes and stunning mountain landscapes. The most impressive stretch may be the Million Dollar Highway connecting Ouray to Silverton. The pass is known as one of the easiest non-paved mountain roads in the region, but is just tough enough to keep away vehicles with low clearance. The 10-mile pass links Telluride and Silverton and has great views of Lizard Head and the red drenched peaks of Red Mountain Pass. The Lizard Head Wilderness is comprised of 41,500 acres of land mostly above 9,000 feet, with three peaks reaching their summits at more than 14,000 feet. Only one major highway is in the vicinity, but the area is home to more than 40 miles of trails. This is pristine San Juan territory. The Uncompahgre National Forest encompasses the northern San Juan Mountains, the Uncompahgre Plateau and three alpine wilderness areas, making it an expansive hub for outdoor recreation. The Mount Sneffels Wilderness Area encompasses 16,565 acres of land surrounding the iconic peak of its namesake. Skirting Telluride to south and Ridgway to the north, the area has fifteen miles of designated hiking trails, and many view the scramble up the 14,150-foot Mount Sneffels as one of the most rewarding summits in Colorado. Inspired by the hut systems of Europe and Canada, the San Juan Hut System is a unique and exciting way to experience the backcountry with the aid of touring skis or mountain bikes. Winter huts run across the Uncompahgre Range and the two summer sets connect from either Telluride or Durango to Moab, Utah. Self-labeled the “Switzerland of America,” Ouray is nestled in a tightly-wound canyon with sheer cliffs raised to the sky in every direction. The town has a hot spring pool and is home the world’s first ice climbing park. Originally constructed in 1879 to haul silver and gold ore out of the mining-rich San Juans, the train now shuffles passengers 45 miles through narrow canyons, stunning peaks and wild mountain vistas. Several trains leave Durango in the morning and return from Silverton in the evening. Telluride has always been known as one of the most beautiful places to ski in the world. What people didn’t know was that the resort offers one of the highest vertical drops in North America, averages more than 300 inches of fluffy powder every year, and has unrivaled lift-accessed backcountry. The resort is the staple of Telluride tourism.